Finally, introducing the new expandable pet carrier by pet peppy which allows a spacious comfortable space for your pet are you tired of the following? Weak unstable pet carriers which kinks up or bends while you carry your pet? Non-travel friendly pet carriers without a handle or strap for securing your pet? Small pet carriers which are claustrophobic to your pets and may affect their health long-term? 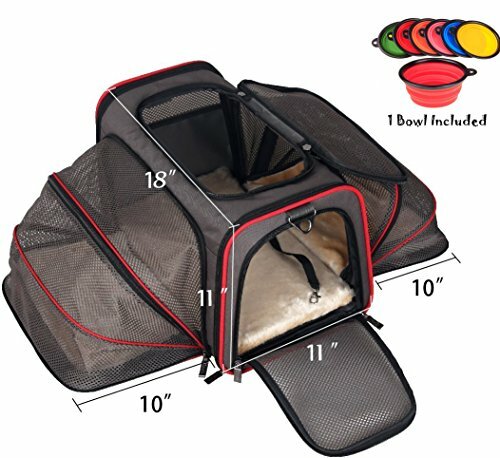 No storage space for pet food or toys introducing your very own pet peppy's carrier to the rescue you will love how this carrier works expandable from both sides- being wedged inside a typical pet carrier doesn't give your animal much room to move or stretch. This can be particularly problematic if they are older and have sore joints. With pet peppy's expandable pet travel carrier, two of the walls zips open into a roomy extension, giving your pet room to turn around, sprawl out, and even invite friends over. The mesh lining also gives them a chance to see your face, keeping them calm and happy. Revolutionary design- wire frame in both sides support the carrier to be more stereo. Two zipper doors are easy to access. Side-pockets can store small goods. Good air circulation- mesh sides allows air to circulate more freely, keeping your pet from overheating and providing a fresh supply of oxygen. Airline friendly- our adjustable shoulder strap and handle allows you to secure carrier to suitcase for easy mobility while traveling. The expandable space function allows your pet to lay down and relax during your car ride or airplane travels (please check airline regulations before flying) we cannot guarantee this special pricing, so be sure to click buy now and try this expandable pet carrier risk free . AIRLINE APPROVED PET CARRIER: Dont you think your pet deserves the same kind of love and care in an airplane that it gets from you at home. With the PetPeppy Double Expandable Pet Carrier your pet can now travel safely while lying down with utmost comfort and safety throughout the journey. Expertly crafted roof ventilation design allows for air circulation, keeping your pet from overheating and providing fresh supply of oxygen at all times. Easily stow away under the cabin seat. SUPERIOR QUALITY: This masterfully crafted airline pet carrier tote is made from high quality safe, eco friendly and durable materials. The result, you can now easily travel with your furry little one with utmost peace of mind. Features removable plush faux fleece bedding, padded shoulder strap and spacious extra storage compartments.﻿ The pristine grade nylon material is lightweight, durable and sturdy, ensuring no hassle reliance day after day, use after use, air mile after air mile. DOUBLE EXPANDABLE DUAL ENTRY DESIGN: What good is a travel pet carrier if it isnt convenient. Double zippers on top and side allows for easy entrance from both sides. The high quality zippers don't snag and arent accessible to the pet inside. The dual expansion feature makes it a breeze to fold down, unzip one or both sides to create extra room for the pet depending on your furry little ones size. Includes a comfortable washable liner and a leash ring inside to keep your pet secure. Enjoy the peace of mind that comes without any hassle. BONUS AND EXTRA STORAGE: Our extra bonuses and generous storage space make this airline approved pet carrier a must have. Includes an adorable random colored pet bowl, so your furry little munchkin can feed in style. The soft padded shoulder strap easily lets you carry your pet like any other carry on luggage. The gentle faux fleece bedding is plush, comfortable and easy to wash. The extra storage and pockets allow plenty of room for pet treats, toys, food and other essentials. NO RISK PURCHASE: Pet Peppy is a truly remarkable company offering one of the absolute best travel pet carrier totes on the market. Buy with utmost confidence. If for any reason you arent happy, simply contact us and we will refund the product for you. 100 percent without risk. Zero hassles, zero waits. Add to Cart now and join thousands of satisfied pet owners worldwide. If you have any questions about this product by Petpeppy.com, contact us by completing and submitting the form below. If you are looking for a specif part number, please include it with your message.